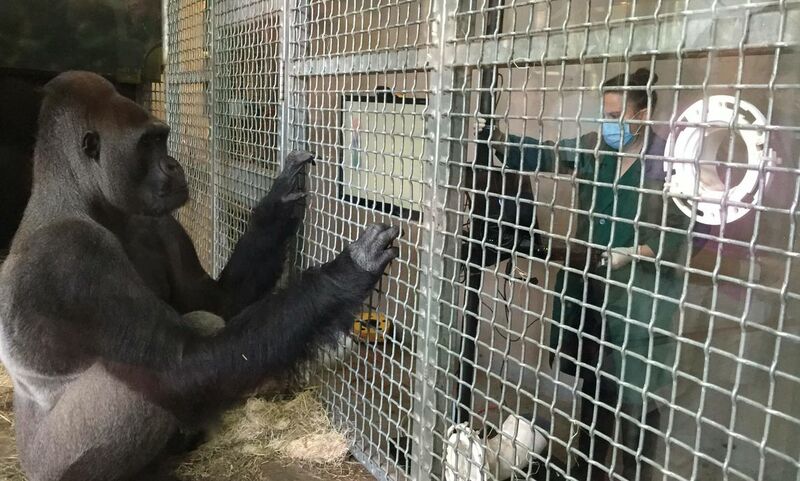 At Chicago’s Lincoln Park Zoo, a Franklin & Marshall College professor and four colleagues examined memory retention in chimpanzees and western lowland gorillas. They found the apes remember the actions of a live model performing a task than those of an inanimate device. As lead researcher in the study, F&M Assistant Professor of Psychology and Scientific and Philosophical Studies of the Mind Lauren Howard said the team developed a cutting-edge, noninvasive eye-tracking method to examine the influence of social context on the apes’ attention and memory. The five chimpanzees and two gorillas watched a video of a human hand (social model) constructing a tower from wooden building blocks and a video of a mechanical claw (non-social condition) performing the same task. The eye tracker allowed the researchers to passively record exactly where the apes were looking while they watched the videos, and also what they remembered after the fact. Lincoln Park Zoo’s Lester E. Fisher Center for the Study and Conservation of Apes research team, led by Assistant Director Lydia Hopper, Ph.D., and including Director Stephen Ross, Ph.D. and Katherine Wagner, collaborated with Dr. Howard and Professor of Psychology Amanda Woodward, at the University of Chicago, for this project. This research was collected on exhibit at Lincoln Park Zoo’s Regenstein Center for African Apes. The chimpanzees and gorillas voluntarily participated in the research while remaining in their social groups on exhibit. Additionally, members of the zoo’s Hurvis Center for Learning interpreted the study to guests and shared the importance of voluntary participation throughout the duration of the research. The research team’s findings will be published Jan. 20 in the journal Scientific Reports.